4. What outputs are available with Pix4Dengine? 6. Is there a graphical user interface (GUI) with Pix4Dengine? 7. What is the difference between Pix4Dengine Cloud and Pix4Dengine Server? 8. Can I use Pix4Dengine on my own server infrastructure, such as AWS or Azure? 9.What system requirements are needed for Pix4Dengine Cloud? 10. What system requirements are needed for Pix4Dengine Server? 11. Does Pix4D offer integration services for Pix4Dengine? 12. Is there training for Pix4Dengine? 13. What type of support can I get as an enterprise customer? 14. How is Pix4Dengine priced? 15. Where can I find security information about your infrastructure? How does Pix4D ensure my data is secure? Pix4Dengine is a set of programming modules running on your infrastructure or on our cloud, which are fully compatible with other Pix4D solutions. There are two modules available today: Pix4Dengine Server, and Pix4Dengine Cloud. These modules are built to empower customization, automation and integration into any enterprise system and reality-capture workflows. 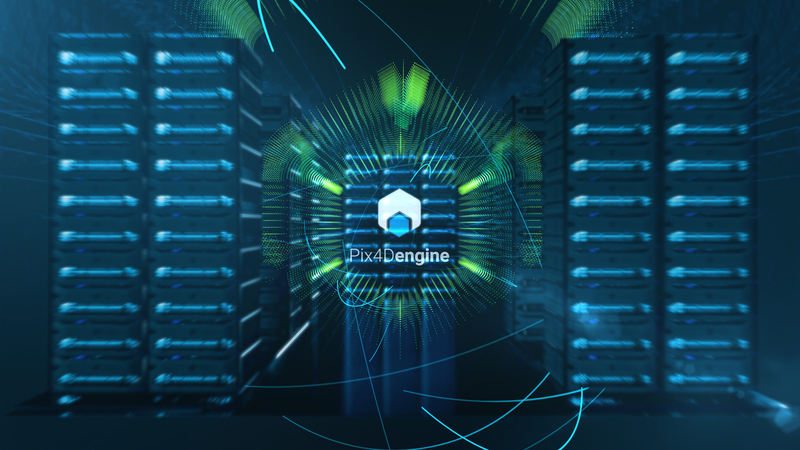 If you want to learn more about Pix4Dengine and how this product is built by our developers, please read the interview of our Pix4Dengine’s product manager--Niels Van Eldik. 2. What is the difference between Pix4Dmapper and Pix4Dengine? Pix4Dmapper embeds off-the-shelf workflows which users interact with through a graphical user interface (GUI), either on desktop or on the cloud. This GUI allows users to set the processing parameters, view and edit the data outputs, extract additional information, as well as to share and collaborate with other users. Pix4Dengine comes without any GUI, but with programming interfaces. These interfaces allow users to programmatically control the processing pipeline powered by Pix4D, route data from the custom sources to the desired end point, and to build streamlined and automated workflows, integrated into any system. If you are already a Pix4Dmapper user and are interested in Pix4Dengine, please contact us. 3. Does Pix4Dengine work with other Pix4D products such as Pix4Dmapper, Pix4Dbim and Pix4Dfields? Yes, Pix4Dengine produces outputs that are compatible with other Pix4D products. Projects processed with Pix4Dengine can be opened and edited with Pix4Dmapper. Orthomosaic and index map outputs from Pix4Dengine are compatible with the analysis tools of Pix4Dfields and Pix4Dbim. For a detailed list of outputs from Pix4D products, please see here. Pix4Dengine grants access to the backbone algorithms and image processing pipelines that Pix4D excels at. These modules allow you to programmatically rig infrastructure around our software to build automated and customized workflows and integrated into existing platforms. You can thus process large amount of data on-demand, and use them exactly for what you need. Pix4Dengine comes without any GUI, but with programming interfaces. Various GUIs are available in Pix4Dmapper, Pix4Dbim and Pix4Dfields, fully compatible with the outputs provided by Pix4Dengine. This makes possible to graphically interact with the data at some points into the workflow to further digitize, check, measure and collaborate. This combination of tools empowers the most efficient mix of automation and productivity for your business. Some of our users have developed a fully customized user interface on top of Pix4Dengine and its programming interfaces, to build their own platform or even product. We provide consulting and integration services upon request to add functionalities around our processing pipelines including graphical user interfaces. Please contact us if interested to discuss your needs and how we can help. Both Pix4Dengine Server and Pix4Dengine Cloud allow users to programmatically control the processing pipeline powered by Pix4D, and to build customized and automated workflows, integrated into any system. Pix4Dengine Server is a software development kit (SDK) based on the Python development language. It is delivered in the form of a library that can be downloaded from your Pix4D cloud account. This library is installable onto either Linux or Windows operating systems. Pix4Dengine Cloud is a RESTful application programming interface (API) based on the HTTPS protocol. It is hosted on Pix4D’s proprietary Amazon S3 infrastructure. As such it includes powerful computing capabilities combined with load balancing to process your data. The API is immediately available as soon as you get authenticated with your license on Pix4D’s cloud. No software download and installation are required. Of course! You maintain ownership of data and may move data wherever it’s needed. Pix4Dengine Server allows you to programmatically control the processing pipeline powered by Pix4D into your own infrastructure needs. No specialized hardware is required to run Pix4Dengine Cloud, as it is hosted on Pix4D’s proprietary Amazon S3/EC2 infrastructure. We take care of optimizing performance of our cloud infrastructure so our customers get their results a quickly as possible. It is immediately available as soon as you get authenticated with your license on Pix4D’s cloud. Interfacing with Pix4Dengine Cloud can be done with virtually any hardware or operating system platform that runs common programming languages. The only thing you need is an internet connection. Using the API can involve uploading and downloading large quantities of data. So fast internet connection is required for a smooth experience. In terms of operating system, Pix4Dengine Server is available for Windows and Linux based operating systems. Instructions can be found on our knowledge base for Linux and Windows installations. In terms of hardware, Pix4Dengine Server works best on compute optimized hardware. Our most recent benchmarks indicate that 8 cores per project instance work best as the current standard. For details please check our support site for processing speed and system requirements. Yes, we offer consulting and integration services to help you implement and deploy Pix4D technology effectively across your organization. Please contact us to discuss your needs and how we can help. Yes, we have a customized training curriculum to help your team take full advantage of what you have built with Pix4D Enterprise Solutions. Please contact us to discuss how we can help. Enterprise support is complementary with Pix4Dengine licenses. For more details about this support plan, please see our Support page. Pix4Dengine is priced on a consumption basis, presumed or effective. The cost is associated with the size and quantity of imagery processed. Please contact us for more details about pricing. Security of your data is a top priority for Pix4D. We are GDPR compliant and apply industry best practices. For detailed information about our security practices, please contact us.